I've known the work of Danish photographer Fredrik Clement for some time. I've been looking forward to chatting with him and yesterday I had the chance. He has an office next to Larry vs Harry's workshop and we talked about our mutual interest in photographing people on bicycles - whether cycle chic or racing cyclists. The whole aesthetic experience. As you damn well know, you will rarely see lycra around this neck of the internet, but Fredrik's photographs are beautiful and brilliant. Above is Fabian Cancellara on a photo shoot Frederik did for racing team Saxo Bank in the Canary Islands. Here's some other Saxo Bank cyclists from the same shoot. 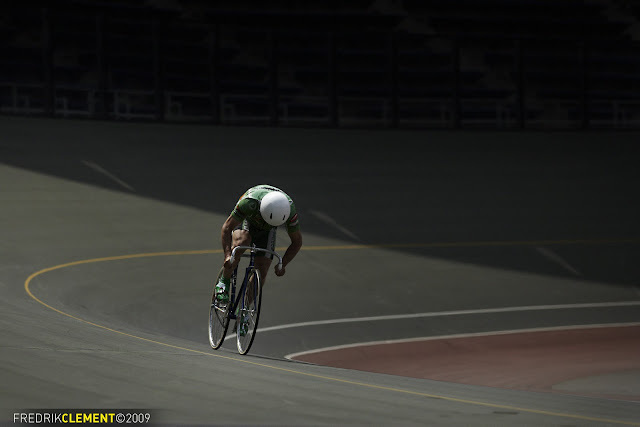 Here's a photo from a series shot in Japan at a velodrome. I'm looking forward to reading the story of this shoot on Fredrik's blog. On both the website and the blog there are great photos of all manner of sports, from American football to sumo.